For assistance with IPA transcriptions of Cantonese for Wikipedia articles, see Help:IPA/Cantonese. The standard pronunciation of Cantonese is that of Guangzhou, also known as Canton, the capital of Guangdong Province. Hong Kong Cantonese is related to the Guangzhou dialect, and the two diverge only slightly. Yue dialects in other parts of Guangdong and Guangxi provinces, such as Taishanese, may be considered divergent to a greater degree. A syllable generally corresponds to a word or character. Most syllables are etymologically associated with either standard Chinese characters or colloquial Cantonese characters. Modern linguists have discovered there are about 1,760 syllables being used in the entire Cantonese vocabulary, which cover the pronunciations of more than 10,000 Chinese characters. Therefore, the average number of homophonous characters per syllable is six. Phonetically speaking, a Cantonese syllable has only two parts – the sound and the tone. A Cantonese syllable usually consists of an initial (onset) and a final (rime/rhyme). There are about 630 syllables in the Cantonese syllabary. Some of these, such as /ɛː˨/ and /ei˨/ (欸), /poŋ˨/ (埲), /kʷeŋ˥/ (扃) are no longer common; some, such as /kʷek˥/ and /kʷʰek˥/ (隙), or /kʷaːŋ˧˥/ and /kɐŋ˧˥/ (梗), have traditionally had two equally correct pronunciations but are beginning to be pronounced with only one particular way by its speakers (and this usually happens because the unused pronunciation is almost unique to that word alone), thus making the unused sounds effectively disappear from the language; some, such as /kʷʰɔːk˧/ (擴), /pʰuːi˥/ (胚), /tsɵi˥/ (錐), /kaː˥/ (痂), have alternative nonstandard pronunciations which have become mainstream (as /kʷʰɔːŋ˧/, /puːi˥/, /jɵi˥/ and /kʰɛː˥/ respectively), again making some of the sounds disappear from the everyday use of the language; and yet others, such as /faːk˧/ (謋), /fɐŋ˩/ (揈), /tɐp˥/ (耷) have become popularly (but erroneously) believed to be made-up/borrowed words to represent sounds in modern vernacular Cantonese when they have in fact been retaining those sounds before these vernacular usages became popular. On the other hand, there are new words circulating in Hong Kong which use combinations of sounds which had not appeared in Cantonese before, such as get1 (note: this is nonstandard usage as /ɛːt/ was never an accepted/valid final for sounds in Cantonese, though the final sound /ɛːt/ has appeared in vernacular Cantonese before this, /pʰɛːt˨/ – notably in describing the measure word of gooey or sticky substances such as mud, glue, chewing gum, etc. ); the sound is borrowed from the English word get meaning "to understand". Note the aspiration contrast and the lack of voicing contrast for stops. The affricates are grouped with the stops for compactness in the chart. ^ a b c In casual speech, many native speakers do not distinguish between /n/ and /l/, nor between /ŋ/ and the null initial. Usually they pronounce only /l/ and the null initial. See the discussion on phonological shift below. ^ a b c d Some linguists prefer to analyze /j/ and /w/ as part of finals to make them analogous to the /i/ and /u/ medials in Mandarin, especially in comparative phonological studies. However, since final-heads only appear with null initial, /k/ or /kʰ/, analyzing them as part of the initials greatly reduces the count of finals at the cost of adding only four initials. ^ Some linguists analyze a /ʔ/ (glottal stop) in place of the null initial when a vowel begins a sound. The position of the coronals varies from dental to alveolar, with /t/ and /tʰ/ more likely to be dental. The position of the coronal affricates and sibilants /t͡s/, /t͡sʰ/, /s/ is alveolar and articulatory findings indicate they are palatalized before the close front vowels /iː/ and /yː/. The affricates /t͡s/ and /t͡sʰ/ also have a tendency to be palatalized before the central round vowels /œː/ and /ɵ/. Historically, there was another series of alveolo-palatal sibilants as discussed below. Finals (or rimes/rhymes) are the part of the sound after the initial. A final is typically composed of a main vowel (nucleus) and a terminal (coda). A terminal can be a semivowel, a nasal consonant, or a stop consonant. The semivowel /i/ is rounded after rounded vowels. Nasal consonants can occur as base syllables in their own right and these are known as syllabic nasals. The stop consonants (/p, t, k/) are unreleased ([p̚, t̚, k̚]). 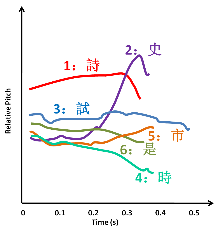 The following chart lists all the finals in Cantonese as represented in IPA. Note: a b c d e Finals /ɛːu/, /ɛːm/, /ɛːn/, /ɛːp/ and /ɛːt/ only appear in colloquial pronunciations of characters. They are absent from some analyses and romanization systems. A narrow transcription of the vowels that are conventionally transcribed /aː, ɐ/ is actually [ɐː, ɜ], as both are central and not fully open. The same can be said of the diphthongs /aːi, aːu, ɐi, ɐu/, as their actual phonetic realizations are [ɐːi, ɐːu, ɜi, ɜu]. See the vowel charts at the right. When the three checked tones are separated, the stop codas /p, t, k/ become allophones of the nasal codas /m, n, ŋ/ respectively, because they are in the complementary distribution in which the former three appear in the checked tones and the latter three appear in the non-checked tones. Like other Chinese dialects, Cantonese uses tone contours to distinguish words, with the number of possible tones depending on the type of final. While Guangzhou Cantonese generally distinguishes between high-falling and high level tones, the two have merged in Hong Kong Cantonese and Macau Cantonese, yielding a system of six different tones in syllables ending in a semi-vowel or nasal consonant. (Some of these have more than one realization, but such differences are not used to distinguish words.) In finals that end in a stop consonant, the number of tones is reduced to three; in Chinese descriptions, these "checked tones" are treated separately by diachronic convention, so that Cantonese is traditionally said to have nine tones. However, phonetically these are a conflation of tone and final consonant; the number of phonemic tones is six in Hong Kong and seven in Guangzhou. For purposes of meters in Chinese poetry, the first and fourth tones are the "flat/level tones" (平聲), while the rest are the "oblique tones" (仄聲). This follows their regular evolution from the four tones of Middle Chinese. The first tone can be either high level or high falling usually without affecting the meaning of the words being spoken. Most speakers are in general not consciously aware of when they use and when to use high level and high falling. In Hong Kong, most speakers have merged the high level and high falling tones. In Guangzhou, the high falling tone is disappearing as well, but is still prevalent among certain words, e.g. in traditional Yale Romanization with diacritics, sàam (high falling) means the number three 三, whereas sāam (high level) means shirt 衫. The relative pitch of the tones varies with the speaker; consequently, descriptions vary from one sources to another. The difference between high and mid level tone (1 and 3) is about twice that between mid and low level (3 and 6): 60 Hz to 30 Hz. Low falling (4) starts at the same pitch as low level (6), but then drops; as is common with falling tones, it is shorter than the three level tones. The two rising tones, (2) and (5), both start at the level of (6), but rise to the level of (1) and (3), respectively. The tone 3, 4, 5 and 6 are dipping in the last syllable when is an interrogative sentence or an exclamatory sentence. 真係? "really?" is pronounced [tsɐn˥ hɐi˨˥]. The numbers "394052786" when pronounced in Cantonese, will give the nine tones in order (Romanisation (Yale) saam1, gau2, sei3, ling4, ng5, yi6, chat7, baat8, luk9), thus giving a good mnemonic for remembering the nine tones. Like other Yue dialects, Cantonese preserves an analog to the voicing distinction of Middle Chinese in the manner shown in the chart below. The distinction of voiced and voiceless consonants found in Middle Chinese was preserved by the distinction of tones in Cantonese. The difference in vowel length further caused the splitting of the dark entering tone, making Cantonese (as well as other Yue Chinese branches) one of the few Chinese varieties to have further split a tone after the voicing-related splitting of the four tones of Middle Chinese. Cantonese is special in the way that the vowel length can affect both the rime and the tone. Some linguists[who?] believe that the vowel length feature may have roots in the Old Chinese language. There are also two changed tones, which add the diminutive-like meaning "that familiar example" to a standard word. For example, the word for "silver" (銀, ngan4) in a modified tone (ngan2) means "coin". They are comparable to the diminutive suffixes 兒 and 子 of Mandarin. In addition, modified tones are used in compounds, reduplications (擒擒青 kam4 kam4 cheng1 > kam4 kam2 cheng1 "in a hurry") and direct address to family members (妹妹 mui6 mui6 > mui4 mui2 "sister"). The two modified tones are high level, like tone 1, and mid rising, like tone 2, though for some people not as high as tone 2. The high level changed tone is more common for speakers with a high falling tone; for others, mid rising (or its variant realization) is the main changed tone, in which case it only operates on those syllables with a non-high level and non-mid rising tone (i.e. only tones 3, 4, 5 and 6 in Yale and Jyutping romanizations may have changed tones). However, in certain specific vocatives, the changed tone does indeed result in a high level tone (tone 1), including speakers without a phonemically distinct high falling tone. Like other languages, Cantonese is constantly undergoing sound change, processes where more and more native speakers of a language change the pronunciations of certain sounds. One shift that affected Cantonese in the past was the loss of distinction between the alveolar and the alveolo-palatal (sometimes termed as postalveolar) sibilants, which occurred during the late 19th and early 20th centuries. This distinction was documented in many Cantonese dictionaries and pronunciation guides published prior to the 1950s but is no longer distinguished in any modern Cantonese dictionary. Williams, S., A Tonic Dictionary of the Chinese Language in the Canton Dialect, 1856. Cowles, R., A Pocket Dictionary of Cantonese, 1914. Meyer, B. and Wempe, T., The Student's Cantonese-English Dictionary, 3rd edition, 1947. Chao, Y. Cantonese Primer, 1947. The initials ch and ts are constantly confounded, and some persons are absolutely unable to detect the difference, more frequently calling the words under ts as ch, than contrariwise. "s" initial may be heard for "sh" initial and vice versa. A vestige of this palatalization difference is sometimes reflected in the romanization scheme used to romanize Cantonese names in Hong Kong. For instance, many names will be spelled with sh even though the "sh sound" (/ɕ/) is no longer used to pronounce the word. Examples include the surname 石 (/sɛːk˨/), which is often romanized as Shek, and the names of places like Sha Tin (沙田; /saː˥ tʰiːn˩/). The alveolo-palatal sibilants occur in complementary distribution with the retroflex sibilants in Mandarin, with the alveolo-palatal sibilants only occurring before /i/, or /y/. However, Mandarin also retains the medials, where /i/ and /y/ can occur, as can be seen in the examples above. Cantonese had lost its medials sometime ago in its history, reducing the ability for speakers to distinguish its sibilant initials. In modern-day Hong Kong, many younger speakers are unable to distinguish between certain phoneme pairs such as /n/ vs. /l/ and /ŋ/ vs. the null initial and merge one sound into another. Although that is often considered as substandard and is denounced as being "lazy sounds" (懶音), it is becoming more common and is influencing other Cantonese-speaking regions (see Hong Kong Cantonese.) 肚餓 is sometimes read as [tʰoŋ˩˧ ɔː˨] not [tʰou̯˩˧ ɔː˨], 雪櫃 is sometimes read as [sɛːk˧ kʷɐi̯˨] not [syːt˧ kʷɐi̯˨], but sound change of these morphemes are limited to that word. ^ While most linguists state that Syllable = Sound + Tone, a few prefer to say that Tonal Syllable = Base Syllable + Tone. For the sake of simplicity, this article chooses to use the first equation. ^ Lee, W.-S.; Zee, E. (2010). "Articulatory characteristics of the coronal stop, affricate, and fricative in Cantonese". Journal of Chinese Linguistics. 38 (2): 336–372. JSTOR 23754137. ^ a b "Cantonese Transcription Schemes Conversion Tables - Finals". Research Centre for Humanities Computing, The Chinese University of Hong Kong. Retrieved March 5, 2019. ^ Alan C.L. Yu. "Tonal Mapping in Cantonese Vocative Reduplication" (PDF). Retrieved 27 September 2014. This page was last edited on 14 March 2019, at 22:34 (UTC).